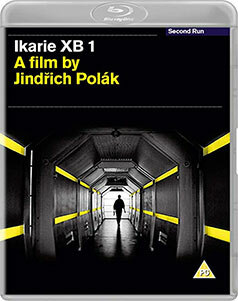 Jindřich Polák's 1963 science fiction film IKARIE XB 1 was an influence on Star Trek and 2001: A Space Odyssey, and now looks as good as it did on its original release in a new 4K restoration from the Czech National Film Archive. Slarek revisits a visionary work on Second Run's recently released and impressive Blu-ray. Given the internationally pervasive nature of the Hollywood product and the sheer number of science fiction movies that have emerged from the US over the years, it's hardly surprising that we tend to regard the genre as a primarily American phenomenon. This is particularly true of films involving space exploration, whose international popularity mirrored a very real worldwide interest in America's own highly successful and much trumpeted space programme. It's thus all too easy to forget that the first orbiting satellite and the first manned spacecraft both hailed from the former Soviet Union. It is, however, somewhat typical of the propagandist nature of cold war politics that while American achievements in this field were celebrated in the West as daring conquests that fired the imagination, their Russian equivalent were often cast instead as sinister developments, a prejudice encapsulated by American president Lyndon B. Johnson's 1963 claim that "I do not think this generation of Americans is willing to go to bed each night by the light of a Communist moon." We can thus presume that this politically principled man would have refused to bed down at night or look at the sky in wonder had the Russians got to the moon before the Americans. Yet in a way, they did. Despite making an inelegant landing, the Russian unmanned Luna 2 probe was the first man-made craft to reach the moon's surface, a good three years before the American Ranger 4 did likewise. In spite of these achievements, just about the only Russian science fiction film involving space travel that most seem to have heard of is Andrei Tarkovsky's magisterial Solaris, and even that was later subjected to an American remake to tinker with its tone and re-work the dialogue in American audience-friendly English. Before I start coming across as all superior on a subject about which I know little, I should point out that in spite of my fondness for space-bound adventures, I was until relatively recently unaware of the scope of science fiction cinema of the former Eastern Bloc. All that changed in 2011, when the BFI Southbank ran a series of such films under the collective title of Kosmos: A Soviet Space Odyssey. The expected Tarkovsky double of Solaris and Stalker aside, this was a revelatory collection that included such exotic titles as the 1936 Cosmic Voyage, the 1959 The Silent Star, the 1962 Planet of Storms, and the 1924 blockbuster Aelita, Queen of Mars. But prince of these splendid rediscoveries has to be Jindřich Polák's 1963 Czechoslovakian space opera, Ikarie XB 1 . Based on the novel Magellan Cloud by Solaris author Stanislaw Lem, the film is set in the year 2163 aboard a spaceship bound for the distant star of Alpha Centauri, which is orbited by planets that scientists believe are capable of supporting life. During the course of the journey, the routine and locational restrictions of their mission see the crew's initial enthusiasm begin to wane, all of which changes when they encounter what appears to be an abandoned alien ship. In case you haven't guessed it, the title of the film is also the name of the ship on which these cosmonauts are travelling, one that apparently translates as “Icarus XB 1,” a questionable choice for a craft that is heading towards a distant sun. Then again, the film makes no secret that the mission is destined to take a dramatic turn, announced in an opening sequence in which crew member Michal (Otto Lackovič), wide-eyed with terror and brandishing a laser pistol, proclaims that the Earth has vanished and then blows away the camera on which he is being observed by his concerned crewmates. This is soon forgotten as Captain Vladimir Abajev (Zdenĕk Štĕpánek) recalls the earlier stages of the mission, and an engaging and briskly paced portrait unfolds of a collection of lively and initially enthusiastic crewmembers as they socially and professionally interact and carry out their individual duties on the ship. More a small community than the traditional spaceship crew – complete with a pet dog and a woman due to give birth on the voyage – they behave much as they would if they were stationed on Earth, meeting for meals, going to the gym, and even dancing and flirting at social events. One of the younger males even procures a sunflower from the astrobiology lab with which to court a new female officer, his every move observed on CCTV by older crew members in what is effectively an on-board TV reality show. This intriguing social portrait peaks at a social gathering in which future visions are interwoven with elements from the distant past, as the guests dance to sombre electronic music using steps that would not be out of place in a medieval court. This is followed by a livelier and more recognisably 60s number that plays a little like a collision between the famous café dance in Bande à part and a social gathering from The Prisoner. In their gender and age mix and the distinctive nature of their personalities, the crewmembers here have more in common with their later compatriots in Star Trek than the more militarily inclined astronauts and cosmonauts of the real world and the late 60s genre-defining film duo of 2001: A Space Odyssey and Solaris. The similarities to Star Trek do not end there. Like the Starship Enterprise in all of its incarnations, the Ikarie is a craft of luxurious size, a "small cosmic town" able to comfortably house a crew of forty, with a sizeable gymnasium and relaxation area, a dining room and lounge, three saucer-shaped shuttle craft, a spacious and circular bridge with individual work stations and a large view screen, and enough food, fuel and other requisite supplies for a 28-month journey. There's a control deck scanner that requires its operator to look directly into a dual eyepiece that foreshadows the one operated by Spock on the Enterprise bridge, and the hand blaster with which Michal takes out that security camera looks like it fell through a wormhole from one of the later Star Trek movies. The ship even sports the sort of dual sliding doors that became such a signature feature of Roddenberry's series, although the ones here strike me as more practical in their design (they overlap in a way that offers superior security and privacy than their Enterprise equivalent). They are also opened by passing a hand over a sensor, then speculative technology that has since come to pass and is now a common way to operate taps and flush mechanisms in institutional rest rooms. 2001 is also prefigured here, in the strip-lit angular corridors, the large communication screen (a neat reveal that plays for its first few seconds like a memory) and some remarkable effects work that places actors inside or on top of convincingly designed and rendered models. That's not to say that Ikarie XB 1 doesn't do its own share of borrowing, notably from Forbidden Planet in the off-key "electric tonalities" of the score and a robot that looks and sounds a little like a low-rent version of the iconic Robbie from Fred Wilcox's still captivating 1956 ground-breaker. Being set so far into the future, the film handily sidesteps questions about how perishable commodities such as fruit, vegetables and meat could be kept fresh over the course of so long a journey (we just assume that science has cracked that) and how the craft is able to complete a multi-billion mile journey in about eight months (ditto). Indeed, one of the remarkable aspects of the film is what it is able to convincingly communicate through visual suggestion, as with the tubes of bubbling liquid that I instantly assumed were part of an oxygen recycling system, or the gravity boots whose function is revealed not through expositional dialogue, but in the way the soles light up when they make contact with a metallic floor. Quite how this effect was achieved is anybody's guess – nowadays you'd probably use of small, remotely controlled LED lights, not something you could pick up at Radio Shack back in 1963. So brisk is the pace and so busy the surface detail that the gradual effects of apathy and cabin fever amongst the crew seem to kick in before you realise they were even coming and are captured in moments of seemingly minor significance: the piano lesson that stalls midway when the teacher wanders off after complaining that something needs to happen; the gym that after four months no longer attracts the number of visitors it once did; Michal's disproportionately explosive response his colleague's incessant chatter. But it's when that earlier mentioned social gathering is disrupted by a ship-wide alert that the film starts to move into potentially darker territory, as two crew members are dispatched to explore a stalled craft whose contents I'm not about to reveal here, a ship-boarding scene as tense and chilling as any I've seen since I first sat down for Alien in 1979, which Ikarie predates by sixteen years. From this point on, an air of potential disaster hangs over the ship, which is underscored when crew members Michal and Erik step outside to install the reserve engine, a routine procedure that, according to the Captain’s retrospective narration, "was the beginning of a grave danger for all of us." Although played by Czech actors speaking the Czech language, the Ikarie was clearly intended to be seen as an international endeavour. This is, after all, not a Czech national mission but one launched by the 'World Astronautical and Space Centre' and one whose crew includes distinctly non-Czech sounding names like MacDonald, Marcel Bernard, Erik Svenson and even Anthony Hopkins. A pro-communist political subtext has been read into the film (and was cut from the heavily reworked American version titled Voyage to the End of the Universe), but the message is actually a science fiction standard, with the citizens of a utopian future society shaking their heads in sorry disbelief at the warlike nature of their barbaric ancestors. More power to them. Did I mention that the film was an influence on Star Trek? Ikarie XB 1 is a genuinely remarkable achievement on a number of fronts. Its production design, model work and special effects are all extraordinary for their day, its characters are engaging and quickly defined, its science, when discussed, is theoretically sound (the result, no doubt, of having six scientific advisers) and its technology is forward-looking and intermittently prophetic. It also makes for a gripping, entertaining and character-driven drama that moves at a pace that will occasionally leave the inattentive struggling to catch up. Despite that opening portent of trouble to come, the film rarely signposts where it intends to head next, to the extent that just three minutes from the end I could not work out how the story could possibly conclude in anything approaching a satisfactory manner. Yet that's just what it does, and without feeling rushed or intellectually short-changing its audience. Sourced from a new 4K restoration by the Czech National Film Archive, this 2.35:1 1080p transfer represents a notable jump over its already solid SD predecessor, with a more generous contrast range and an unsurprisingly increased level of image detail. The solid black levels are still there but do soften slightly in the darker scenes to clarify detail that was sometimes sucked into the shadows on the DVD. Any previous damage and dust has been cleaned up. Very nice. The Linear PCM 2.0 mono soundtrack has the inevitable age-related restrictions in its dynamic range but is otherwise clear and has to background hiss, fluff or damage. The English subtitles that switch on by default can be deactivated if you’re fluent in Czech. I am not. The venerable Mr. Newman offers a typically engaging appreciation of the film and provides some useful background detail on the socio-political conditions under which it was made, as well as its influence on later works, plus a breakdown of the cuts and alterations made for the original American version. This has been ported over from the earlier DVD release and is in standard definition. A short documentary about mathematics that makes no attempt to look at the specifics of how complex calculations are made and instead focuses on the importance and ubiquity of mathematics in modern society, There’s a semi-abstract quality to some of the imagery and editing choices, which is enhanced by the more experimental elements of Ilja Hurník’s score, which together with the film’s thematic concerns (notably the development of computer programming) provide a direct link to the main feature. Framed 4:3 and displaying small signs that it has been compiled from more than one source, this opening sequence for the US American International release has the same editing and music as the Czech original, but has drastically westernised the on-screen credits. Thus, actors Zdeněk Štěpánek and František Smolík are now Dennis Stephens and Francis Smolen, editor Josef Dobrichovský has been renamed Joe Derby, Zdeněk Liška’s music is now the work of somebody named Danny List, and director Jindřich Polák has mutated into abstract expressionist painter knock-off, Jack Pollack. The English dub, it has to be said, is rather well done, and often closely matches the actors’ mouth movements. Can’t get into detail here without issuing sizeable spoilers, but it’s very different to the original in significant ways, though in one particular aspect does anticipate a widely celebrated American science fiction film from later in the decade. 47 slides of crisply detailed photos, pages from the German language press book and the English language press book, some original Czech promotional materials, a few posters, Voyage to the End of the Universe US promotional material (including horribly coloured FOH stills) and the Voyage to the End of the Universe Campaign Manual. In what is a first for Second Run, this Blu-ray includes an audio-only Easter egg, which you’ll find by experimenting with the direction buttons on the remote control of your Blu-ray player whilst on the Special Features menu. In this Barbican Film Podcast, Second Run’s Mehelli Modi talks about the film, some of the key personnel, what makes it remarkable, its influence on Star Trek and 2001: A Space Odyssey, the recent 4K restoration, the reason it was so hard to see for so long, and more. It’s a very nice introduction to the film, and Mr. Modi’s suggestion that Second Run should host an Ikarie-themed dance party put a beaming smile on my face. Also included is a Booklet containing the same excellent essay by Michael Brooke that accompanied the earlier DVD release, one that provides detailed information on the development of Eastern Bloc science fiction cinema, the release of the film, the changes made by American International (and a certain Francis Ford Coppola!) for the US release, and its influence on later western genre works. As before, it was a little disconcerting to find so many of the points that I'd made in my review (which itself is an updated version of my earlier one for the Second Run DVD) being so concisely highlighted by Mr. Brooke. That's my story and I'm sticking to it. Back in 2013, I enthusiastically championed Second Run’s DVD release, but even if you have that disc I’d highly recommend getting this Blu-ray upgrade. The new 4K restoration and HD transfer deliver a significant improvement in image quality, and the additional special features are absolutely worth having. If you’ve not seen the film then this is the perfect opportunity to discover this visionary slice of cinematic science fiction and see it in the best shape it’s been seen since it made its first appearance in Czech cinemas. Repeating myself here, but highly recommended. The film review above has been updated from my review of the 2013 Second Run DVD release.